We had about twenty vehicles on site last Sunday with our Club and the visiting Scottish Land Rover Owners Club. Ground conditions were fantastic with lots of sliding around in the mud. 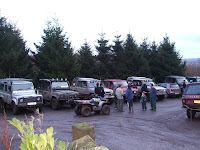 Videos are on you tube if you enter as your search "Glentarkie"
The water around the big pond is seriously deep, at least two feet above normal level after all the rain. Take care!! The clubhouse area has now been moved around to suit us better now that we have sold the land adjacent to the parking area. Please excuse us for the current mess but this will all be clared and a new surface put in before christmas. We had a very good safari today with lots of members. The ground conditions made it really difficult but very interesting! 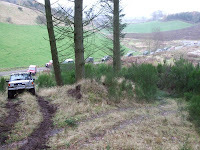 Thanks to everyone, I had a great time especially watching the big descent in the wood and all the winching after it. More photos on the website shortly. Rain, rain and more rain!!!!! The water is very deep at the moment, it just about caught me out!!!!! 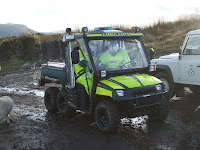 The Scottish Ambulance Service started a training program today on our site for their new resourse vehicle and also Land Rover driving. 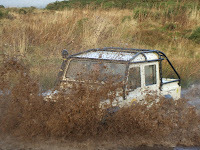 They will be good fun to watch and the new vehicle is very capable. 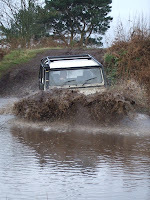 Plenty of rain at last and the Scottish Mud Club who are coming this Saturday 7th will have lots of fun and the water is VERY deep. I lost a hedge bill blade on site doing the bushes last week, please just leave it in reception if you find it. Hopefully not finding it through your tyre!!!!!! !